* An attractive bright A4 card featuring a grid of numbers 0-10, and showing the corresponding number of pictures. The days of the week, the months of the year, numbers 1-20, the seasons, colours, greetings and key phrases. Also available in English only. 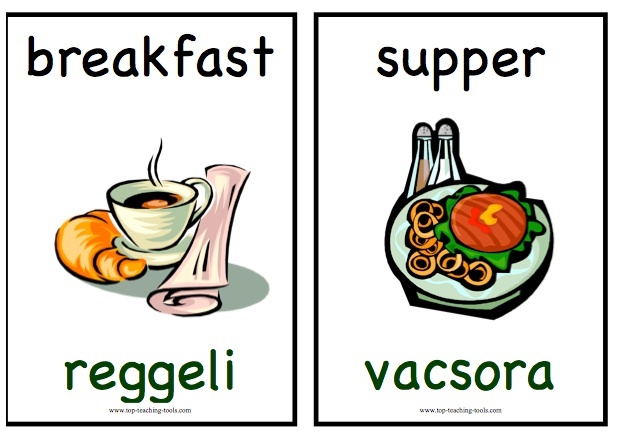 This resource is suitable for people learning Hungarian or Hungarian speakers learning English. Flash card games and ideas. 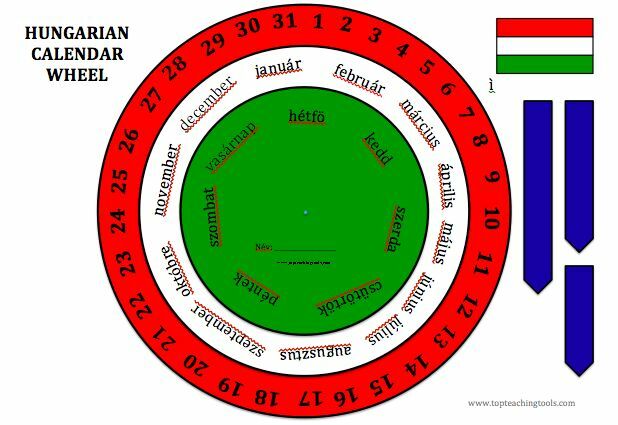 Use our fun and colourful wheel to learn and practise the Hungarian date, days of the week and months of the year! Print out and laminate. A perfect resource for reinforcing the days of the week and months of the year. Pupils love to set the arrows each day. Teach and reinforce Hungarian / English numbers. This fantastic pack of *90 flash cards* is a fun way for pupils to reinforce the Hungarian / English numbers: 1-20, 30, 40, 50, 60, 70, 80, 90, 100 and 1000. 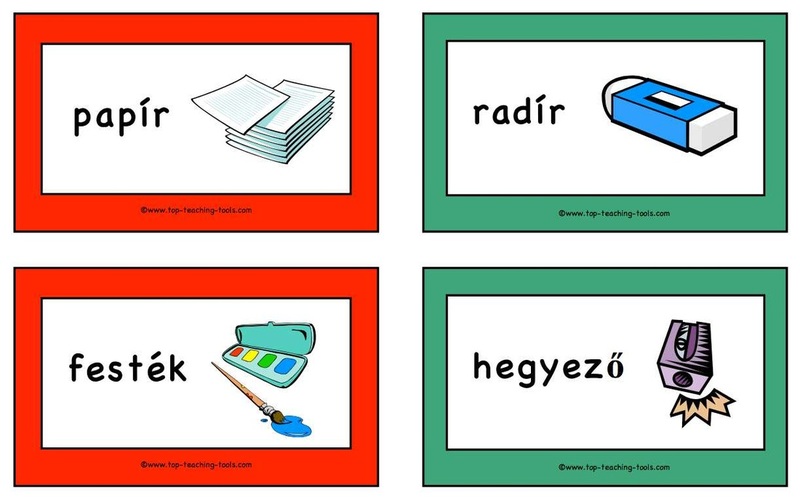 These flash cards are grouped in threes: with the Hungarian number, the English number translation and the figure. They can be used in any combination and therfore provide maximum flexibility and differentiation. Ideal for group and individual teaching, for extension, reinforcement, early finishers etc. * 16 cards showing the English and Hungarian word and picture. * 16 cards showing just the Hungarian word and picture. * 16 cards showing just the English word and picture. * 16 cards showing just the picture. * 16 cards showing just the Hungarian word. * 16 cards showing just the English word. * Ideas for different language games to play. 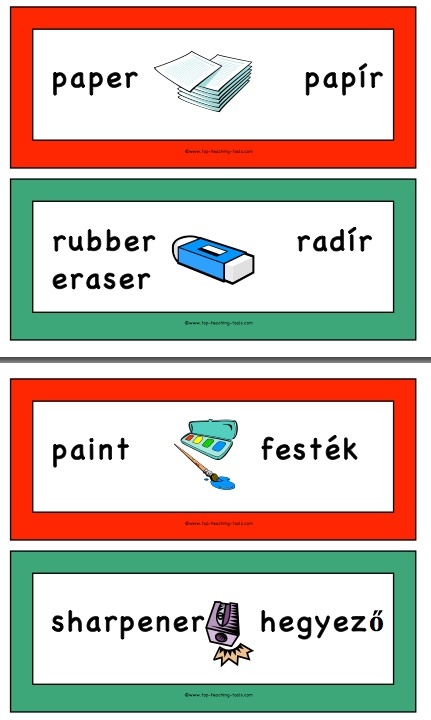 Two top-quality worksheets for reinforcing Hungarian colours. * One rainbow colours worksheet. * One colours train worksheet. * 33 small flash cards (for individual and group games): 11 with the colour, 11 with a picture and 11 with the Hungarian colour word. 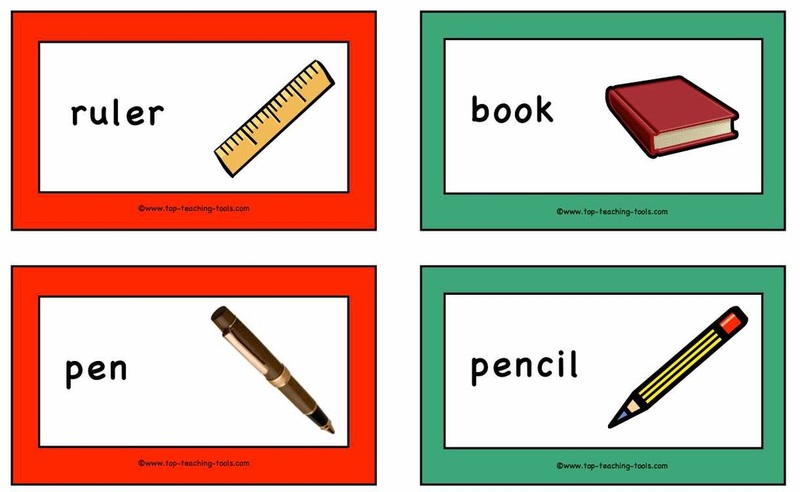 * Teachers' notes and ideas for different flash card games to play. 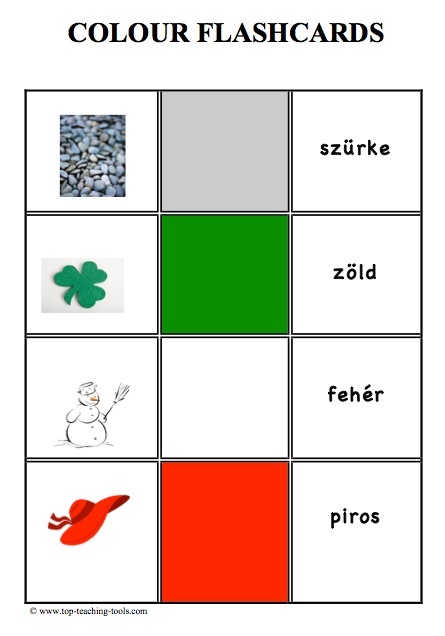 * Cards showing the Hungarian and English colour words. * Cards showing just the English word and colour. * Cards showing just the Hungarian word and colour. * Cards showing just the colours. * Instructions for language games. 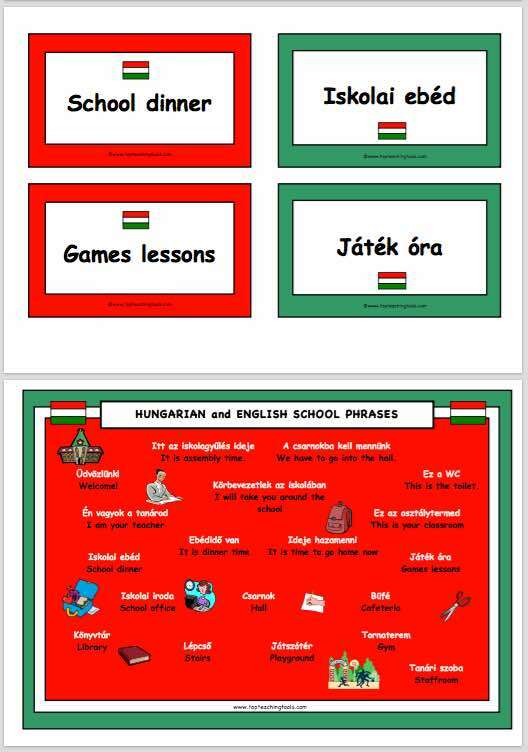 * Two Hungarian colours worksheets. * 15 cards showing the Hungarian and English words. * 15 cards showing just the English word. * 15 cards showing just the Hungarian word. * Ideal for using as flash cards for group or individual use. * Perfect display labels for around the classroom. * Could also be used as homework cards. The corresponding words are produced side by side. * 36 word and picture cards.